Tom outside his bakery, The Old Forge. The marriage of Mary Elizabeth Ashton to Sidney R Skinner in 1926. 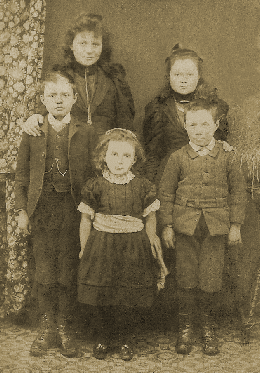 This family photograph was taken outside The Old Forge, Church Road, Preston. 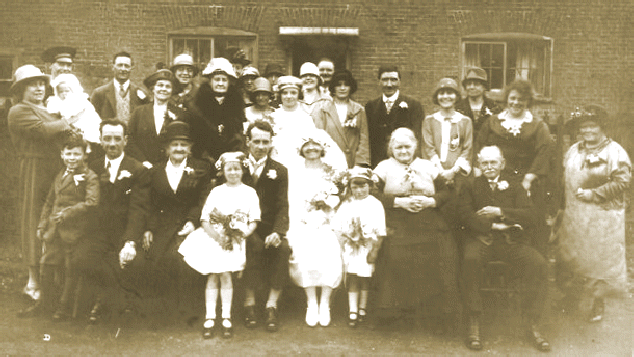 Front row , l to r: ?,?,?,?, Sidney R Skinner (groom), Mary Elizabeth Ashton (bride), -, Catherine (Kate) Ashton, Tom Ashton. Tom was in constant pain from a hernia. He died on 25 April 1934. 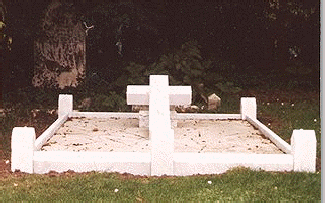 Tom and Catherine are buried in a double grave in St Martins churchyard. Discovering what ‘made things tick’ was a passion for Tom. He liked clocks and delighted in repairing them. ‘The Old Forge’ resounded not with the sound of a blacksmith’s hammer but with a cacophony of chimes from the many clocks which festooned its walls. Tom also made a crystal radio set from a kit. He would listen to broadcasts of classical music and, as he was able to read music, he would follow recitals using his own score. Clearly Tom was one of Preston’s familiar figures. On one occasion he organized a charabanc trip for the villagers to watch the Derby horse race at Epsom. Tom was the enumerator at Preston when the 1911 Census was taken. Perhaps not quite so well appreciated by the locals was his work as rating officer for Preston. At the Preston parish meeting of March 1895, Tom was appointed ‘overseer’. They put down their roots at ‘The Old Forge’, Church Road which they rented from Geoffrey Pryor. Their home was almost opposite the lychgate of St Martins Church. This was a convenient location for Tom as he was the organist at the church. His daughter Catherine Rose pumped the organ bellows. If Tom thought the sermon was dragging, he would look at his watch and glance meaningfully at the vicar. such as my aunt, Maggie Whitby (nee Wray) delivered Tom’s bread and cakes by bicycle and 14-year-old Reginald Peters was a bakery helper in 1901.
own means of transport - a pony and trap - which he used to collect supplies and deliver his delicacies. He also used the trap to visit his brother Arthur in Hitchin. Sometimes he would fall asleep on the return journey - but the pony would take him safely home. 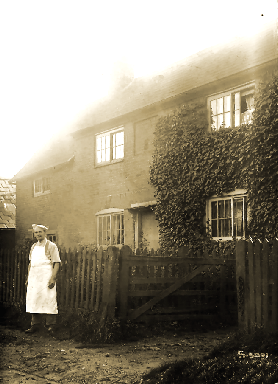 Tom Ashton was the baker in Preston from the mid-1880’s. Born on 5 April 1856 in the village of Hawnes, Beds, Tom was the son of master baker James Ashton and Elizabeth. He was brought up in the Bedfordshire village of Shillington where, at the age of 14, he assisted his father in the bakery. 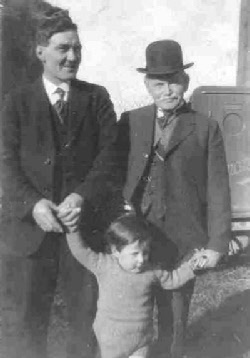 Left: Three generations of Ashtons in 1926c - Tom, son Stephen and grandson, Thomas. Stephen exaggerated his age and called himself Charles S. Ashton in order to join the army. He served in the Boer War and World War I in Egypt. Tom and Catherine were living at Arlesly, Bedfordshire. in 1878. By the winter of 1884 they had moved to Stevenage, Herts and they arrived in Preston a few years later. 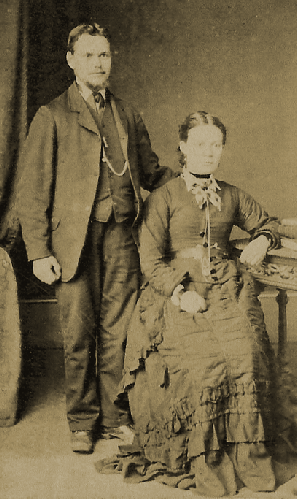 In 1878, Tom (21) married Catherine (Kate) Smith (21) at Shillington. Catherine was the daughter of publican Frederick Smith. He kept the ‘Queens Head’, Swan Street, Weston, Herts.